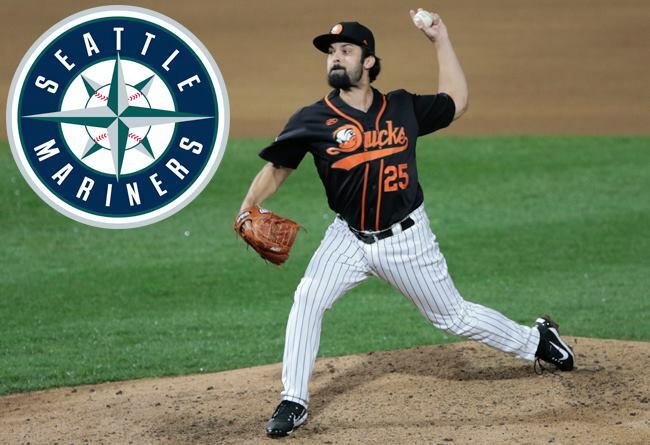 (Central Islip, N.Y., June 2, 2018) – The Long Island Ducks today announced that left-handed pitcher Daniel Schlereth’s contract has been purchased by the Seattle Mariners organization. He will report to the Double-A Arkansas Travelers. Schlereth appeared in eight games with Long Island and did not allow a single run. In seven and one-third innings of work, the southpaw conceded just one hit and four walks while striking out eight batters. He limited opponents to a miniscule .045 batting average against and .185 on-base percentage against while recording at least one strikeout in six of his eight games. Additionally, he surrendered a walk in just one of his final four outings. The 31-year-old has four seasons of Major League experience, including one year with the Arizona Diamondbacks (2009) and three with the Detroit Tigers (2010-12). In 94 appearances, he compiled a 5-6 record with a 4.35 ERA, one save and 91 strikeouts over 93 innings of work. The Alaska native also made three postseason appearances with the Tigers in 2011, as Detroit reached the American League Championship Series. The 2008 first round draft pick (26th overall by the Diamondbacks) spent the 2017 season in the Miami Marlins organization, pitching at three different levels. He combined to post a 2.38 ERA in 37 games with five saves and 39 strikeouts over 41 and two-thirds innings of work. Schlereth becomes the fifth Duck to join a Major League organization in 2018 and the second whose contract was purchased during the 2018 regular season (catcher Wilkin Castillo, Yankees). Three members of the 2017 Ducks, including infielder Giovanny Alfonzo (New York Mets), catcher Alex Burg (Los Angeles Dodgers) and catcher Jordan Pacheco (Minnesota Twins) were all signed prior to the season.